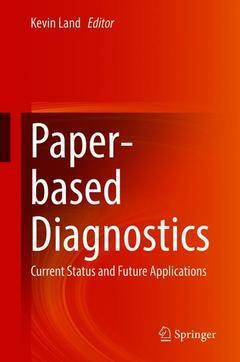 This book explores the status of paper-based diagnostic solutions, or Microfluidics 2.0. The contributors explore: how paper-based tests can be widely distributed and utilized by semi-skilled personnel; how close to commercial applications the technology has become, and what is still required to make paper-based diagnostics the game-changer it can be. The technology is examined through the lens of the World Health Organization?s ASSURED criteria for low-resource countries (Affordable, Sensitive, Specific, User-friendly, Rapid and robust, Equipment-free, and Deliverable to end-users). Its applications have to include: health technology, environmental technology, food safety, and more. This book is appropriate for researchers in these areas, as well as those interested in microfluidics, and includes chapters dedicated to principles such as theory of flow and surface treatments; components such as biomarkers and detection; and current methods of manufacturing. Examines how paper-based diagnostics could be integrated with other technologies, such as printed electronics, and the Internet of Things. Introduction.- Background to Paper-based Diagnostics.- The Need.- Principles.- Components.- Manufacturing.- Integration with Other Technologies.- Academic and Commercial Groups.- The Future of the Technology. Kevin Land is the Microsystems Platform Leader at The Council for Scientific and Industrial Research (CSIR) in South Africa.